On Friday, March 1st Our Lady’s Bower hosted its second consecutive Scifest@School fair. We were thrilled once again to welcome 6th class students from Tubberclare NS, St Mary’s NS and Scoil na gCeithre Máistrí to participate in the event. These young STEM enthusiasts presented over 20 projects on the day and we would like to thank their parents and teachers for facilitating their involvement. Our guest judges from AIT and Ericsson had a tough time selecting winners, with over 70 of our own students entering projects into the competition also. St Mary’s NS took 1st place in the Primary School section. In the Junior Category, 1st place went to Shauna Scullion with her project “Super Soap”. Joint runners-up were; Niamh Riordan, Portia Quaye and Mary Doyle with their project “Heatstroke Detection Cap” and Hannah Lennon, Eimear Galvin and Millie O’ Brien with “Code Red”. This project also won the Display prize. Highly commended projects included; Hannah Duffy and Niamh Jordan with “Irish Heather Honey Means BuZZness” and Grace Gormley and Áine Galvin’s entry “Crappy Nappy”. 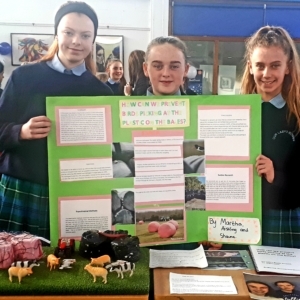 In the Intermediate Category, 1st place went to Aoife McDermott and Ashling McCarthy with their technology project “Track That Crash”, with Paula Davila Sanchez Brinas taking the runner-up prize for her project “Noise Pollution”. 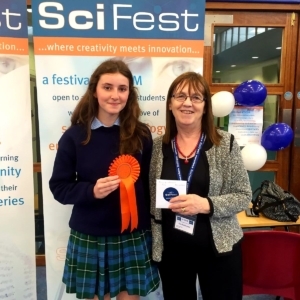 Finally, our Senior Category 1st place went to Kate Duffy and Isabelle Clarke with “Sphagnum: a Super Solution for Superbugs”. Emma Gleeson and Cliodhna Murtagh were runners-up with “Overpopulation”. 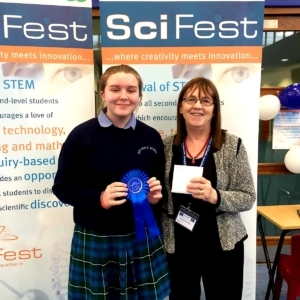 Thank you to Ms Sheila Porter and her Scifest team for enabling students to put STEM into action through this competition. Thank you also to our local guest judges from AIT and Ericsson, who gave their time so generously to attend the event. Well done to the school’s Science department and all the students they mentored over the past number of months. A huge amount of work was on show on the day.